Fried Rice Syndrome, or You Can’t B. cereus! So a couple of weeks ago, I went to a restaurant I frequent for cheap, quick Hong Kong cafe food (fried rice with broiled saucy pork chops on top, fried chicken wings, tapioca drinks, etc.) and ordered fried rice for breakfast. Since I’ve eaten there before, I didn’t think anything of it. A couple of hours later while at a friend’s post-Christmas party, I suddenly felt like I had the flu: muscle aches, fever, and running to the bathroom every hour or so. First, I thought I suddenly was allergic to cats (again), so my friend gave me some allergy meds. That didn’t work. Considering I had some stomach symptoms, my friend brewed me some really strong tea. After a few cups of that, most of the symptoms went away. I remembered from my microbiology class that there’s a certain species of bacteria, called Bacillus, that is the cause of many types of food poisoning. Going through my notes, I found out that a particular type, Bacillus cereus, is the cause of the illness I had that day: fried rice syndrome. B. cereus apparently lives in uncooked rice but is very hardy and can survive even when the rice is first being steamed. When the cooked rice is left out in a warm environment (and not in the refrigerator), B. cereus can grow and multiply. Even when the resulting rice is fried, the heat and oil don’t kill it. In fact, the oil helps to promote growth in B. cereus until the rice gets eaten. People either end up throwing up or having diarrhea as a result. Considering I only ate a small amout of the rice, I only had muscle cramps and felt like crap. If I had eaten the whole thing, it would’ve been a lot worse, as many people who have fried rice syndrome often have to go to the emergency room. 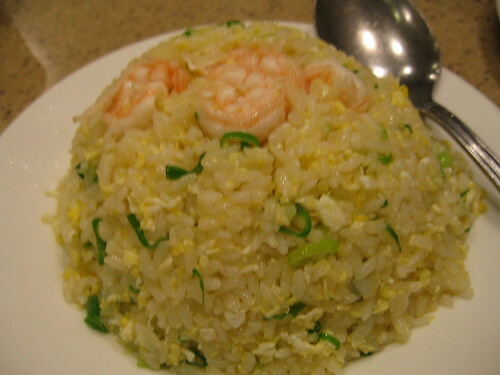 Fried rice syndrome is totally different and not to be confused with MSG syndrome, a psychosomatic disorder where physical symptoms are caused by the racist belief that MSG is in Asian foods and causes abdominal symptoms. Funny how people who have this can eat non-Asian foods that are loaded with MSG, like cheese, mushrooms, and peas, and don’t have these same symptoms. But I digress. In another interesting factoid, a different species of Bacillus, B. subtilis, is the organism that helps make natto, or Japanese fermented soybeans, and is totally edible without any ill effects. Well, depending on who you talk to; some people think natto is nasty. I like natto myself. So the moral of the story is if you want to make fried rice, put the rice in the fridge after you’re done steaming the rice and before you fry it. And if you order fried rice in a restaurant, order it in the evening, when the rice is more likely to be fresher and not subject to being left outside for extended periods of time. Previous Previous post: Chandni Chowk To China: Bollywood Meets Kung Fu!